All of Pharma Nord’s manufacturing facilities and standard production routines comply with the rigid cGMP (current Good Manufacturing Practice) for medical drugs and HACCP (Hazard Analysis and Critical Control Points) for dietary supplements. The reason for this is that the exact same manufacturing team produces both our medical drugs and dietary supplements. Every production staff member is trained to follow the exact same procedures with respect to quality, hygiene, and documentation, regardless of what type of product they are in the process of manufacturing. That way the employees do not have to worry about which set of standards they follow in the different situations. Only one standard applies – the highest of all. At the raw materials inventory, we receive all items needed to produce the finished goods: Packaging materials, excipients, and active ingredients for tablet and capsule manufacturing. Pharma Nord uses only raw materials from suppliers that are able to meet our extremely high quality demands. Every single raw material component has its own strict specification that it must comply with. This is the case not only with active ingredients but even with filling agents and packaging materials. In order to ensure consistently high standards for raw materials, Pharma Nord’s Quality Assurance Manager personally inspects the manufacturing facilities at every one of our suppliers of drug standard active ingredients. All raw materials are registered and assigned a unique batch number so that they can be traced throughout the entire manufacturing process. Upon arrival, all raw materials and packaging components are quarantined. Only goods that comply with pharmaceutical specifications are released for production. Once quarantined goods have been analyzed and approved, they are permitted to enter the production site. Goods that do not comply with Quality Assurance specifications are either returned to the supplier or destroyed onsite. Pharma Nord’s laboratory conducts many of the analyses that are required in connection with the manufacturing of dietary supplements and medical drugs. Although we fully trust the raw material suppliers with whom we have collaborated for years, we always conduct our own analysis of the raw materials received. In addition, random samples are taken out during the manufacturing process and examined, just like the finished products are carefully analysed. Certain analyses that require highly specialised equipment are conducted by accredited external laboratories. Both dietary supplements and medical drugs are examined in accordance with a detailed plan. For instance, we test whether softgel capsules and tablets dissolve within a specified period of time to ensure that the active ingredients are effectively released and absorbed by the body. In the same process, we also check that size and weight correspond to the given specifications. All finished dietary supplements must, as a minimum, undergo one random-sample control analysis a year, whereas each individual production batch of medical drugs must undergo a control analysis in order to document that it meets the specifications. All medical drugs and certain nutritional supplements are submitted to a shelf life test in order to ensure that the active ingredients maintain the right strength at the expiration date of the preparation. 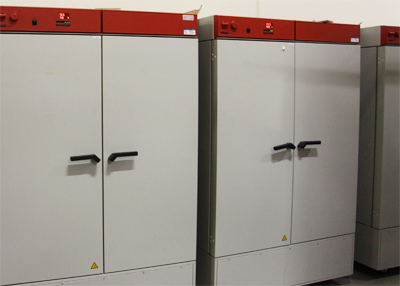 The test is conducted in special climate cabinets with specified temperature and humidity in order to document the quality of the products throughout their entire shelf life. The Quality Assurance Department is responsible for quality assurance and quality control. It is a requirement that the person in charge of this function (Quality Assurance Manager) is independent of supervision by the production staff. Pharma Nord is a certified manufacturer of both dietary supplements and foodstuffs. We always apply the toughest requirements for drug manufacturing (cGMP) and dietary supplements manufacturing (HACCP). cGMP is short for current Good Manufacturing Practice and includes a number of protocols that form the basis for the quality assurance used in the manufacturing of medical drugs and active pharmaceutical ingredients. Pharma Nord’s entire production staff, including the inventory staff, is trained to follow the cGMP rules. This includes self-inspection and external inspection. Besides cGMP, Pharma Nord uses HACCP (Hazard Analysis and Critical Control Points), a system based on risk analyses and critical control points in the production of food. The Quality Assurance Department is responsible for such things as checking raw materials, intermediate products, packaging components and finished goods. As part of these control procedures, the Quality Assurance Department evaluates the batch documentation, the results of the process control, and the results of analyses in relation to pre-determined specifications. Once the specifications are met, the products are released. If not, they are destroyed. The Quality Assurance Department stores reference samples of every single raw material batch and every finished goods batch for at least six years for auditing by the authorities, or in the event of complaints. Moreover, the department is responsible for ensuring that every single department carries out regular self-inspection to guarantee that the cGMP and HACCP rules are followed. If necessary, the Quality Assurance Department must suggest required changes to make sure that the quality assurance systems are kept up-to-date. In addition to Pharma Nord’s self-inspection, we are visited regularly by representatives from the Danish Medicines Agency and the Danish Veterinary and Food Administration, who carefully examine the documentation and inspect our facilities and procedures. Furthermore, we are frequently visited by several of our large customers. Any manufacturer of medical drugs and dietary supplements needs to comply with a variety of rules, especially if the manufactured goods are exported to and sold in other countries. 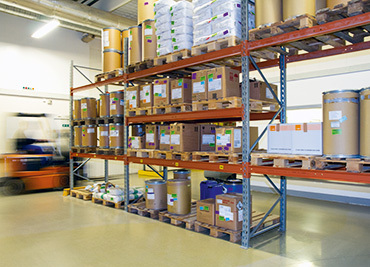 Pharma Nord has its own department to handle this extensive task. The Department of Regulatory Affairs is responsible for documenting and registering all Pharma Nord products in order to ensure compliance with local laws and regulations from country to country. The Department makes sure to track the laws and regulations for each country, paying close attention to local rules applying to both medical drugs and dietary supplements, and to the required amounts of active ingredients for a given product. In many instances, a product that is sold as a medical drug in one country is marketed as a dietary supplement in another. One single production run at Pharma Nord's manufacturing facility may be divided into several smaller operations, for instance in cases in which the product is available in different countries or different box sizes. With some products, there may be different rules from country to country, so two identical products can be registered as a dietary supplement in one country and as a medical drug in another. For this reason, all Pharma Nord products are manufactured in accordance with the highest standard. The products are manufactured to adhere to the strictest medical drug standard available. Since a lot of the products can typically be marketed as a dietary supplement in many countries, this is a win-win for the customer, as the medical drug product standard ensures a safe, high quality product - which is not always the case with less strict manufacturing standards for dietary supplements. This is the “heart” of Pharma Nord’s production plant in Vojens. Here, all the different raw materials are converted to tablets and hard or softgel capsules under tightly controlled conditions. In order to ensure full traceability, every single production is assigned a unique batch number. Before entering the production area, employees enter the locker room where they put on a gown (white coat), a hair net and clean footwear. In addition to wardrobe requirements, employees are required to adhere to strict hand washing procedures. The entire production area is subject to a pressure differential and has a slight positive pressure in order to prevent cross-contamination. The slight positive pressure prevents polluting particles from the outside from entering the production area. The entire production staff must use gloves at all times during manufacturing processes that involve direct contact with products. The station for mixing tablets is the starting point in the production area. Ingredients are mixed in accordance with a long list of standard procedures, and these procedures are thoroughly inspected by Quality Assurance throughout the entire tablet production process. The ready-mixed powder is poured into a mobile container that is transferred to the next work station, where the powder is pressed to tablets or filled in hard capsules. The final workstation coats tablets with a protective layer that extends their shelf life and makes them easier to swallow. The coating station provides tablets with designated color or protective layers that safeguards the active ingredients. During the manufacturing process, the contents are carefully measured and verified, and we also make sure that the gelatin shell has the correct thickness. All of this is documented at specified time intervals during the production and checked afterwards by means of random sampling of the finished softgel capsules in Pharma Nord’s own laboratory. Once the softgels have been assembled, they pass through a series of chambers that serve as tumble dryers. 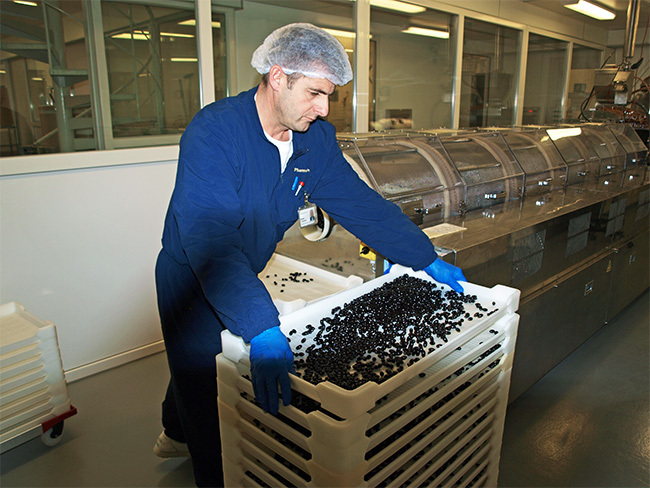 Capsules are then collected in large plastic trays and placed in a special drying compartment for another day or two. The dried softgel capsules are sorted, and capsules with the wrong shape or size are discarded. The rest of the batch is now ready for packaging in large plastic bags that are quarantined until the quality control has been completed. During production, several quality control procedures help ensure a standardized production. Upon completion of every single production step, the softgels or tablets are thoroughly inspected for adherence to standardized production measurements in terms of weight, content, dissolution time, etc. Concurrent with production, Regulatory Affairs inspects all control documents to verify that all procedures have been executed according to proper procedures. The production of one single product involves filing as many as 32 different Quality Control documents. After each round of production, the machines are cleaned, effectively removing any trace of the former product in order to avoid cross-contermination and preparing the machines for the next production run. The cleaning procedure is very thorough. In fact, the cleaning routines are so comprehensive that it may take between 6 and 24 hours to prepare one single machine for the next round of production. All cleaning procedures in the production area are validated, which means that their efficacy is verified so that no products are exposed to contamination. The cleaning act is checked and documented on check lists. When the different products have been released from the Quality Assurance Department, they are ready for packaging. After the production has been completed, the finished tablets and capsules are stored in large containers in the storage area until they are ready to be shipped. A sufficient number of tablets and capsules is taken out from these containers (for inspection) every time a new batch is ready to be packed in boxes and shipped off to retailers in all of the countries where our products are sold. One single production may be divided into a variety of smaller operations, for instance in cases where the product is available in several countries or in different box sizes. With some products there may be different rules, so two identical products end up as either a dietary supplement in one country or a medical drug in another. For this reason, all products are manufactured in accordance with the highest standard. A product that is manufactured as a medical drug can easily be sold as a dietary supplement. This is not the case the other way around. All Pharma Nord’s tablets and capsules are packaged in hygienic blisters. This increases the shelf life of the product after the package has been opened. When production is finalized and the products have been packaged and released by the Quality Assurance Department, the products are shipped off to distributors and retailers worldwide. Pharma Nord’s dietary supplements and medical drugs are available online, in pharmacies and in health food stores in more than 45 different countries. The combination of pharmaceutical production standards and the restriction of sales to stores and pharmacies that provide consumers with useful advice given by health professionals is one of the main reasons why Pharma Nord has experienced success and recognition globally. All Pharma Nord’s products are manufactured at our state-of-the-art production plant in Vojens, located in the southern part of Denmark. When we say “Produced in Denmark”, it literally means every single step from receiving raw materials to shipping off finished products to our point of sale partners and customers. Our products are not merely softgel capsules and tablets from foreign suppliers, which are repackaged in Denmark like some companies do. The quality of our products are verified and enforced by pharmaceutical control processes under the auspices of the Danish Health Authorities.